"1&1" Reviews (Apr 2019) - Why 4.9 Stars? A leading web host across the board, 1&1 IONOS offers solutions to meet the needs of all customers. Following a 2018 rebrand, the company focused its priorities on customer support and transparent pricing. Thanks to dedicated personal consultants, numerous site builder options, and a variety of cloud offerings, customers can trust 1&1 IONOS for the long haul. “Born in 1988 — at least a decade before many competitors — 1&1 IONOS has maintained its dedication to making technology easy to understand and use. The company got its starts in Europe but has since expanded to serve more than 8 million global customers and host more than 12 million domain names. Part of the United Internet group, 1&1 IONOS relaunched in 2018 after merging with the successful ProfitBricks cloud infrastructure service. The end result is a web hosting company that's perfectly poised to serve everyone from first-time site owners and small businesses to rapidly-scaling corporations in need of powerful virtual and dedicated server options. Web hosting beginners will especially appreciate the company's dedication to a comprehensive user experience. In addition to affordable shared and WordPress hosting, 1&1 IONOS customers can quickly deploy the company's custom drag-and-drop site builder or ecommerce store creator. Marketing tools abound to grow your presence, including for a local business listing on online directories, Google Adwords management, email marketing, and search engine optimization. More experienced customers will find a comfortable hosting home in the various 1&1 IONOS cloud solutions. In addition to somewhat-more-obscure services like S3 object storage, Kubernetes-as-a-Service, or specialized cloud app configurations, the company offers the cloud in managed or unmanaged varieties, plus enterprise-grade Platform-as-a-Service and Infrastructure-as-a-Service options. “If budget is the main factor on your mind when searching for your next web host, search no more. 1&1 IONOS has an impressive range of robust web hosting and website building packages for what may be the best price we've ever seen in the world of hosting. Even better, there are no hidden fees or upsells at checkout — finally, a place in the web hosting world where "what you see is what you get" doesn't apply to just site builders. All 1&1 IONOS plans come with a free domain name registration, or existing site transfer, with permissions to use (essentially) as much storage space and databases as you need. While some hosting shoppers may view the lack of "truly" unlimited features to be a knock on 1&1 IONOS, we actually prefer that the host is upfront about exactly what resources are available — and, trust us, you'll have plenty of resources to work with. Starting a 1&1 IONOS website from scratch is simple. 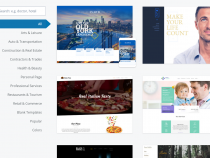 With the 1&1 IONOS MyWebsite Builder and ecommerce store creator, you can easily choose a template, drag and drop various elements of your site, and customize it to your brand or personal preference. 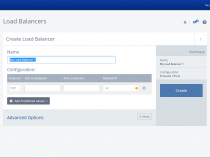 For a bit more control, the company gives you more than 70 cloud applications that can be installed with just one click. “If you need blazing-fast speed, optimum uptime, top-notch flexibility, and full control over the fate of your website the dedicated servers from 1&1 IONOS have you covered. The company offers an assortment of entry-level, performance-focused, and business-class server options. 1&1 IONOS currently operates more than 90,000 servers within 10 geo-redundant datacenters, and the hardware features top-notch Intel Atom and Xeon processors. The company's hands-on approach to perfecting datacenters ensures high levels of uptime and supremely reliable server networks, boasting up to 1 Gbit/s connectivity, unlimited traffic, and HTTP/2 support. Although experienced dedicated server customers might prefer a large cloud environment with root access enabled, rookies and busy entrepreneurs who would prefer to spend their time elsewhere will appreciate the intuitive 1&1 IONOS control panel included with each machine; no server admin is required, meaning you can focus on your projects instead of monotonous maintenance. Users can monitor their dedicated server performance through a web browser, but we also love how 1&1 IONOS offers mobile access to the control panel via apps for both iOS and Android. Unlike many other dedicated server providers, 1&1 IONOS gives customers a free domain registration, unlimited traffic, malware protection, automatic backups, a content delivery network, and even a 30-day money-back guarantee — making the complex dedicated hosting experience as comfortable as shared hosting. “For an all-star player in the game of web hosting flexibility, look no further than the low-cost options from 1&1 IONOS. The company's vServers are a powerful VPS option that includes dedicated resources and unlimited traffic. Customers will receive generous allotments of memory, computing cores, and high-speed SSD storage for rates much lower than many competitors. We appreciate the company's flexibility in offering a wide range of Linux and Windows operating systems, along with the root access to completely control applications and other configurations. 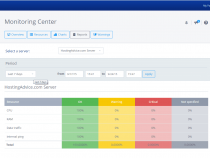 Users can use the Plesk Onyx control panel to manage server operations securely and efficiently. The 1&1 IONOS VPS network is powered by VMware virtualization and redundant SAN storage, backed by Intel Xeon E5 processors and SSDs. For those looking for other virtualized hosting options, 1&1 IONOS boasts numerous managed and unmanaged cloud services. Ranging from object storage to container orchestration, we especially appreciate the pre-configured environments that are optimized to specific application performance needs. Want your WordPress or Magento site to fly? Look into 1&1 IONOS cloud hosting. Experienced developers comfortable with root access will enjoy hourly-billed IONOS Cloud environments, while cloud hosting newbies will prefer the managed, Platform-as-a-Service option. Large companies can build customized, future-proofed environments via the 1&1 IONOS Infrastructure-as-a-Service package. “You're not alone if you're looking for fine-tuned optimizations and security enhancements specifically tailored around WordPress. Hundreds of hosts are clamoring to offer the best services for the world's most popular content management system, and 1&1 IONOS is among the select group leading the way. The company offers all the essentials you would expect from a provider that emphasizes shared hosting simplicity, while still including the features that particularly resonate with more technical WordPress users. First, a setup assistant gets you started with just a few clicks, offering countless options to customize and grow your WordPress site through theme and plugin suggestions. From there, the company's powerful infrastructure — boasting NGINX web server, SSD storage, modern PHP, and 2GB of guaranteed memory — delivers your site with speed. 1&1 IONOS secures WordPress sites by automatically updating the CMS for you, along with providing DDoS protection and optional SiteLock security. The managed platform takes care of all tedious management tasks, and site owners will appreciate the personal consultant that is on standby to answer any WordPress questions via phone, email, or chat. “If you're in need of a one-stop shop for designing and launching a website, you should be pleased to hear that 1&1 IONOS offers its own custom website building tools for both desktop and mobile devices. In addition to a free domain and email address, along with unlimited storage space, the 1&1 IONOS MyWebsite platform includes all the essentials for starting a site from scratch. With MyWebsite packages, you can quickly and easily create a custom website — without any coding or programming knowledge. As if the low introductory rate wasn't impressive enough, 1&1 IONOS MyWebsite packages come with a free 30-day trial period so you can be certain that this easy-to-use solution is the right one for you. The company's drag-and-drop site editor features tons of high-quality, customizable templates. Your site will automatically be optimized for smartphones and tablets, and 1&1 IONOS offers apps to integrate interactive, professional elements into your site, including photo galleries, online scheduling, customer reviews, social media widgets, and maps. For those who are more pressed for time, you can quickly spin up a one-page website or employ 1&1 IONOS design experts to create up to five custom pages with images and SEO-optimized text. Nearly all plans come with a free domain name registration and ample amounts of storage, subdomains, and email accounts. 1&1 IONOS websites are completely customizable, featuring one-click installations for popular applications like WordPress. Alternatively, you can build a site without installing software using the company's drag-and-drop site builder, featuring several packages available with the 1&1 IONOS MyWebsite option. Easily install popular web applications. Experts will suggest popular plugins and extensions for your specific site, and they'll provide guided installations for configuring your content management system. Choose a pre-defined starting configuration, with available sizes ranging from "M" to "XXL," for affordable and easy entry into the cloud. Choose your ideal scripting language, web server, and database to perfectly fit your site's needs. The 1&1 IONOS Cloud allows users to deploy in 55 seconds or less, with load balancing to distribute traffic and ensure optimal performance for your website. Adjust your resources at any time to match the demands of your traffic. Even though 1&1 IONOS relies on by-the-minute billing — ensuring you only pay for what you need — the company's management portal enables you to start or stop resources at any time. If you don't configure resources, you don't pay for them. No minimum contract terms or commitments. With rankingCoach, 1&1 IONOS shines an SEO spotlight on your site, ensuring it is more visible to your audience and search engines. Text and videos walk you through clearly defined tasks, no matter which content management system you use. Constant keyword analysis ensures you receive helpful feedback that drives results. The company's email marketing plans offers a streamlined way to integrate subscription forms and build engaging messages that resonate on all devices. 1&1 IONOS software enables you to monitor campaigns in real time and run A/B testing to fine-tune your strategies, ensuring your marketing efforts are kept efficient and effective. Pay-per-click advertising may seem like rocket science, but 1&1 IONOS will allow you to leverage the company's expertise and resources. Gain exposure almost immediately and connect with millions of potential customers as the company researches keywords, writes ads, and manages campaigns. They'll monitor and optimize your keywords for increased relevance. 1&1 IONOS offers managed server packages with optional performance enhancements in addition to the full slate of web hosting features. Managed hosting customers receive unlimited traffic and 100% SSD storage that delivers speeds up to 10 times faster than HDDs. 1&1 IONOS datacenters, located across the US and Europe, feature advanced hardware, and around-the-clock monitoring. With external connectivity speeds exceeding 300 gigabits per second, you're sure to have quick and easy access to applications. Redundant storage networks, automatic backups and updates, as well as firewalls and DDoS protection ensures everything is designed for maximum security. With proactive protection, malware scanning with SiteLock, and file recovery systems, 1&1 IONOS offers you all the options for defending your site against catastrophe. The company's optional Railgun CDN from Cloudflare provides optimum security and performance for your site, especially when paired with a free SSL certificate. 1&1 IONOS created its own website builder, control panel, and other applications that were all intuitive and easy to navigate. We tested out the 1&1 IONOS Cloud and were impressed by the level of detail that went into the custom configurations. No matter the platform, users can adjust settings at any time, quickly and easily. Site owners can often oversee server status, performance metrics, audience behaviors, and manage security features from a single location. It may sound simple, but we love 1&1 IONOS for simply and transparently communicating about prices — something that's not the norm in the web hosting industry. Even better, the company charges round-dollar totals; no more $3.99 or $4.42 nonsense. Costs are easy to calculate and predict. 1&1 IONOS plans for shared hosting, website building, dedicated servers, VPS, and cloud come in a variety of price ranges with assorted feature sets to choose from in order to meet your web hosting needs. Hosting newcomers and developers with relatively small projects won't find a better deal than 1&1 IONOS shared, WordPress, or site builder hosting. For all levels of these plans, you only need to shell out $1 a month for six to 12 months — no hidden fees, gotcha moments, or restricted features. The company's more advanced options, including dedicated, virtual, and cloud, can be had at either discounted rates for the first six months or receive an astounding $100 credit for the first month, enabling you to see for yourself how scalable and powerful the infrastructure is. 1&1 IONOS boasts supremely reliable uptime rates, thanks to geo-redundant datacenters, mirrored storage, and fault-tolerant networks. The company's security offerings include SiteLock vulnerability scanning and DDoS protection, along with robust monitoring and firewall tools. In addition to top-notch security features, with premium upgrades available, 1&1 IONOS offers automatic backups and data recovery features should disaster strike. Most impressively, however, is the company's dedication to one-on-one personal support. Every plan pairs you with a dedicated consultant that you can reach directly by phone, chat, or email during regular business hours. They'll learn your business, suggest specific optimizations, and help you troubleshoot any issues that may arise. If problems crop up in the middle of the night, 1&1 IONOS staffs local support teams that can help 24/7/365. Wondering how 1&1 stacks up againt other web hosting services? See our host-vs-host reviews below and compare them side by side. 3 out of 7 times. As a leading hosting provider, 1&1 IONOS employees never shy away from putting in the time and resources they deem necessary to improve upon the company's already outstanding web services. If you're seeking a reliable and well-known hosting provider to help you build, design, and grow a website with ease and affordability, 1&1 IONOS is an excellent option at any level. The company's dedicated and virtual server options offer fully managed and self-managed plans, with performance enhancements like SSDs, while dynamic cloud options offer the ultimate flexibility at a price you can afford.